Foiling False Narratives Amidst Unsupported Cries of Balderdash! 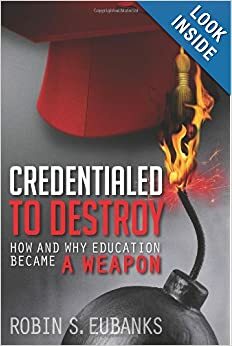 The last post was not designed to ruffle feathers so much as continue to warn that words like Classical or Christian when applied to education, much like what we have already seen with Critical Thinking and Rigor, may not have the actual meaning assumed. I am genuinely worried about the extent to which Classical Education is modeling a psychological template that came out of the Soviet Union to bind the mind and personality. A reader in the comments put up this slideshow http://slideplayer.com/slide/695610/ that reveals a troubling and intentional use of cybernetic techniques via education to mentally and emotionally bind a person for religious purposes. Please scrutinize what on-line vendors or actual charters or privates have in mind when they use these terms. Today we will continue to explore the broader template of what is being pushed under the Classical label and its very troubling bedfellows that were turbocharged in December with the language in the Every Student Succeeds Act (ESSA). A reader contacted a well-known education writer known for being anti-Common Core and pro-Classical Education asking for a rebuttal of what I wrote in the last post. We are going to go through the various responses because they illustrate so well what a muddle these Great Ideas centric educations can actually create. Response 1 was that the post was “Balderdash.” Since that descriptive word would mean writing that is contrary to facts and nonsensical, the natural question became “what is not true?” That provoked a link http://www.nationalreview.com/article/431182/donald-trump-bernie-sanders-gnostic-campaigns that the frustrated reader forwarded to me. I pointed out I never theorize in writing about conspiracies, but that I do get to quote people who declare they are involved in a coordinated effort to use education to achieve some declared transformation of society. Secondly, that article basically insults certain political supporters as acting like people who use a Gnostic simplistic analysis to view the world around them. Well, that was a new criticism and not particularly consistent with the facts. Maybe I was supposed to be horrified, but I did wonder whether someone needed my Inapt Metaphor lesson on lousy analogizing. A few days later I got the final response from the reader who really wanted there not to be some kind of misuse of the phrase ‘Classical Christian education’ for purposes unappreciated by parents. Here is the final criticism of that post and apparently the reason for trying to protect people from either my book Credentialed to Destroy or this blog. I have a few responses in brackets. No, I don’t want the human personality to be allowed to wilt and I also want to develop character. There is an alignment here though of what everyone from Charles Fadel and his well-connected Center for Curriculum Redesign is now pushing as Four-Dimensional Education, what the Dewey acolytes want, and what is being pushed as Classical Education. Every single one is targeting the same areas of what the student is to have internalized and how they are to work together to guide the vision of the future and motivate likely behavior. Common Core talks about its purpose as being College and Career Ready and the Classicist aim is said to be “to form the adult-to-be”? Does that sound like a similar destination to anyone else? I have written before about Carol Dweck, what is called the Growth Mindset, and even that the White House Behavioral and Social Sciences Team has now commenced a national Growth Mindset study. Tell me if that aim fits with the following passage from the Moral Classicism template (my bolding). Notice this is not about the transmission of factual knowledge. Well, someone is specifying those Ideals and creating an education intended to internalize them. I am not sure the student gets much say. Neither will the parents unless they scrutinize what comes in now under the banner of ‘classical’ education. Now I honestly do not know how much those pushing this template as ‘classical education’ appreciate why Evald Ilyenkov created the New Dialectics in the USSR to advance the Human Development Society vision of Marxism that commenced in earnest globally around 1962. I do, however, know an institution that has had a very good handle on this integration of East and West using education. If Harvard’s Project Zero classifies Hicks’ Interdisciplinary Humanities Program as a Pre-Collegiate Program conducive to bringing about “an all-encompassing framework of meaning,” we need to take them at their word on the links to the IB Theory of Knowledge coursework and the notorious constructivist Math and Science programs. http://www.interdisciplinarystudiespz.org/pdf/Nikitina_Strategies_2002.pdf If all of these are cited as means to teach contextualizing or context-building, conceptualization, and problem-solving so that inquiry-oriented coursework becomes a means of teaching social responsibility, the need for social change, and the “primary goal of finding causes and cures for human calamities,” we can assume that the Change Agent Licensors understand where Classical Education is actually going, even if its proponents do not. At this point, I was thoroughly concerned that we once again have Inadvertent Change Agents pushing a remedy to the Common Core they have repeatedly deplored that amounts to jumping from the frying pan into the fire, I went back to who Douglas Wilson cited as his source for his Trivium. Anyone else beginning to question whether the whole Trivium and Quadrivium hype is just a narrative manufactured by someone wanting to hide the clear connections to cybernetic psychological theory and systems thinking? Then the narrative gets repeated until it seems true. Back to Manchester, who pointed out that “there was no room in the medieval mind for doubt, the possibility of skepticism simply did not exist.” He also pointed out “medieval man’s total lack of ego. Even those with creative powers had no sense of self” and “an almost total indifference to privacy. In summertime peasants went about naked.” Aren’t we glad this post is written and not a multimedia presentation? See why I am so suspicious we have yet another false narrative. “For we let our young men and women go out unarmed in a day when armor was never so necessary. By teaching them to read, we have left them at the mercy of the printed word. By the invention of the film and the radio, we have made certain that no aversion to reading shall secure them from the incessant battery of words, words, words. They do not know what the words mean; they do not know how to ward them off or blunt their edge or fling them back; they are a prey to words in their emotions instead of being the masters of them in their intellects. We who were scandalized in 1940 when men were sent to fight armored tanks with rifles, are not scandalized when young men and women are sent into the world to fight mass propaganda with a smattering of ‘subjects’; and when whole classes and whole nations become hypnotized by the arts of the spellbinder, we have the impudence to be astonished. Can’t you still hear the anguish decades later? Sayers thought she had a very good reason for using education to mandate a worldview. Maybe she did. Our problem is that so many now have the same intentions, but obscure the real new purpose and focus of education behind terms we believe still have their dictionary meanings. Dragging this documented reality into the sunlight should not result in cries of Balderdash.